Forbidden Planet remains a seminal moment in the history of science fiction films, combining a huge budget with themes and gadgets that would resurface in many films and television shows. The seriousness of the production and acting would go on to perhaps help legitimize science fiction films. The story has become commonplace in the decades since Forbidden Planet’s release. A crew of spacemen is sent to the distant planet of Altair to relieve the group of scientist’s that have been living there. Commander Adams (Leslie Nielsen, before he got silly) is in charge of the expedition. As they approach the planet the spacecraft gets a strange warning from someone below, and they are encouraged to turn around and go home. Commander Adams is not one to back down, however, so they plow ahead. On Altair the crew is greeted by a large lump of metal, Robby the Robot (in his first screen role). He is an exceedingly mechanical robot, filled with whirrings, clickings, and the sounds of cartridges switching as he talks. Robby takes the Commander and his foremost staff to the residence of the scientists, where they are shocked to discover that only one man is left alive. Dr. Edward Morbius (Walter Pidgeon) explains to the crew that he is the only survivor, unscathed by a mysterious force that inhabits the planet. The other scientists were pulled apart by the creature, leaving only Dr. Morbius and his daughter, Altaira (Anne Francis). She has been raised by her father, with Robby as a companion and aid. Her innocence and naïveté regarding men and her role as a woman in the circle of life provide some amusing moments between her and the crew. The plot gets deeper and more complex as Dr. Morbius eventually reveals more of his secrets to Commander Adams. The history of the planet, involving an ancient alien civilization and fantastic technology, proves to be alarmingly pertinent as the space crew face unanticipated danger. The film is filled with a wonderful visual aesthetic, comprising detailed models and brilliant painted backgrounds. 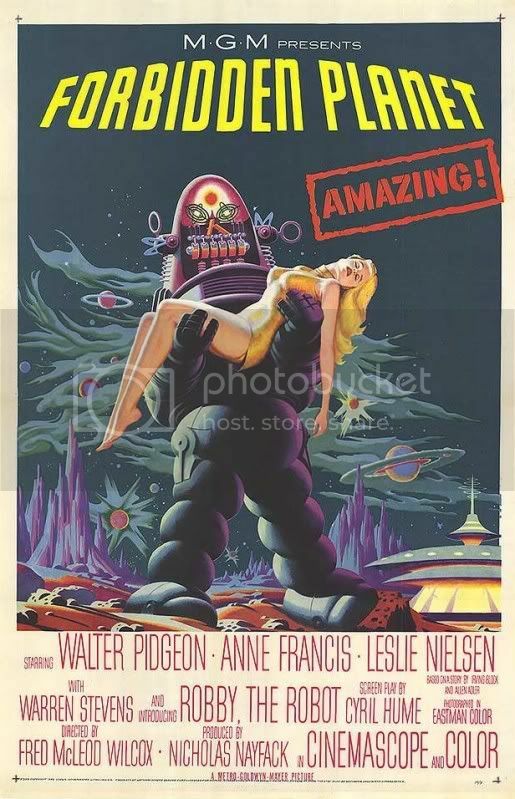 No other sci-fi film from the ’50’s matches the production qualities of Forbidden Planet. Some of the science was also ahead of its time, including wireless communication devices that the space crew utilize. Energy weapons and nuclear power also paved the way for future science fiction adventures. Other aspects of the film are more typical. The characters are rather general, and some dramatic scenes toward the end are fairly cheesy. Most of the time, however, the film is played perfectly straight and is successful. This isn’t necessarily a B-movie one might watch and laugh at with a group of friends. I enjoyed the film, even if it never fully engaged or involved me on an emotional level. It is a remarkable production and most certainly a film any lover of science fiction ought to experience. This entry was posted in 2.5 pirate flags, 3 stars, F, Movie Reviews on January 1, 2010 by Tim Irwin. Your -story -was -really -intifmarove, -thanks! Ah -yes, -nicely -put, -everyone. 1. -Alice -in -Wonderland — -52M2. -Brooklyn’s -Finest — -19M3. -Shutter -Island — -16M4. -Cop -Out — -11M5. -Avatar — -10.5M6. -The -Crazies — -9M7. -Valentine’s -Day — -5.5M8. -Dear -John — -3.5M9. -Crazy -Heart — -2.5M10. -The -Ghost -Writer — -1MMostly -guesses. -Also -I’m -not -sure -if -Ghost -Writer -will -be -a -wide -enough -release -to -justify -that -number.